So, I’m nearly 40 and I’ve been living with my husband and our little family in our own houses for the past ten years now, after finally settling down in our first home in Chichester way back in 2007. 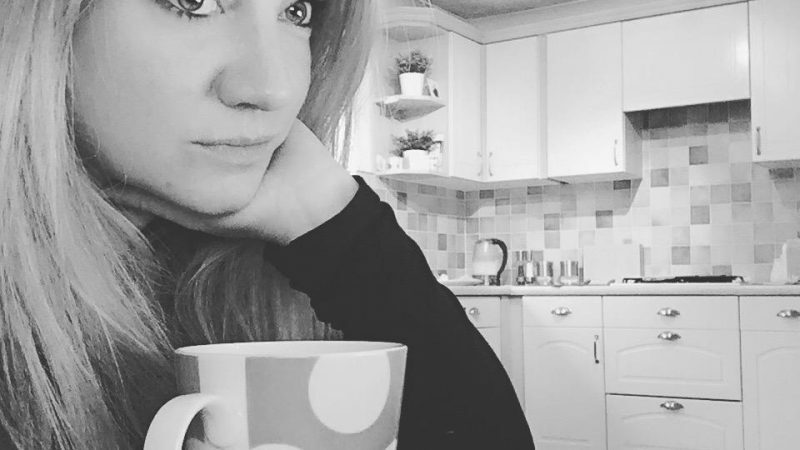 I remember though, how when we moved in, we had absolutely no money to buy anything much for the home ourselves, after all, we’d completely pushed ourselves to our limit and had no funds left over for even a new set of saucepans! So, as I’m sure is pretty commonplace with any first time home buyers, we relied heavily on generous family and friends, and took any hand-me-downs, they would pass over to us. Looking back – I think the only two items which were actually our own, was a bed and a TV! Everything else was passed down to us. So, as a result, you can imagine what it looked like. The space we had in our fab new home was wonderful, and we were a very proud couple indeed, but practically every single item in the house was mismatched and hicaldy-picaldy as nothing really went with anything else. Even the cutlery drawer was a complete jumble of designs. Style was most certainly lacking. But we didn’t care, we had a space of our own that we could call home. To this day though, even though we’ve managed to replace most things, we do still have the odd hand-me-down pieces of furniture or brick-a-brack scattered around the house, and the funny thing is, the longer we keep them, the more fashionable they seem to be becoming. Funny isn’t it – how style and fashion seem to go in cycles. It kind of makes me think I should just hang on to anything and everything. Just in case! Call it what you will though, vintage, antique, traditional, shabby chic, repurposed…. we’ve had the lot! And they are still in our home today. One of my most treasured pieces is an old Parker Knolls arm chair, which used to be the chair my Grandma would sit in. I can remember it in their house as far back as I can recall. It was a piece passed on to me when I was expecting Holly. 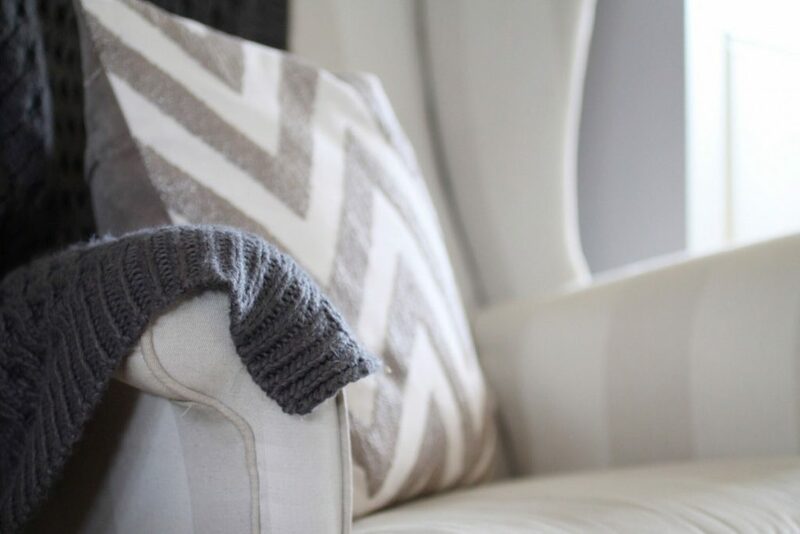 So we thought it would mak a beautiful addition to her new nursery as a relaxed place where I could feed my baby in comfort, so we sent it off to a specialist to be lovingly plumped and recovered. This lovely chair now sits in a corner of our bedroom and is serving the third generation of the family, as we sit and read in it. I can’t imagine ever parting with this, so I’m sure will be sent off again one day for a little more specialist treatment, just to keep it going for as long as we can. 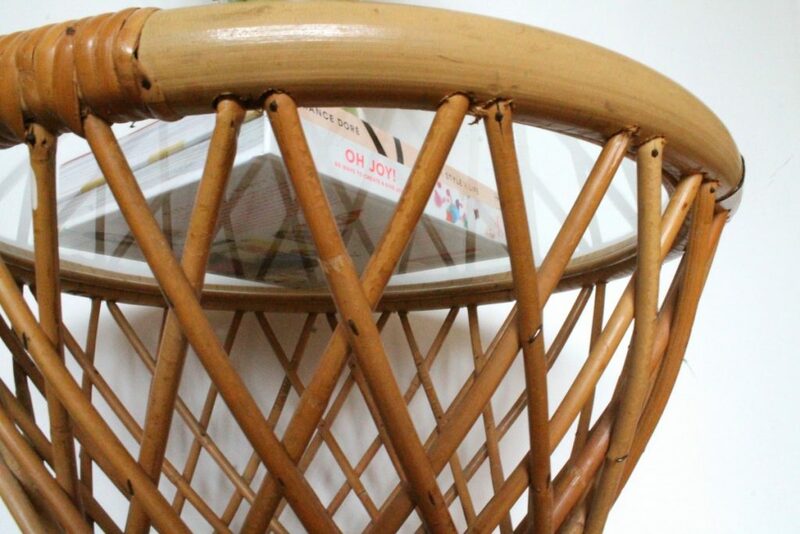 Another piece of furniture we still have is a little wicker and glass side table, which was given to us, along with many other things, by my husband’s lovely parents. 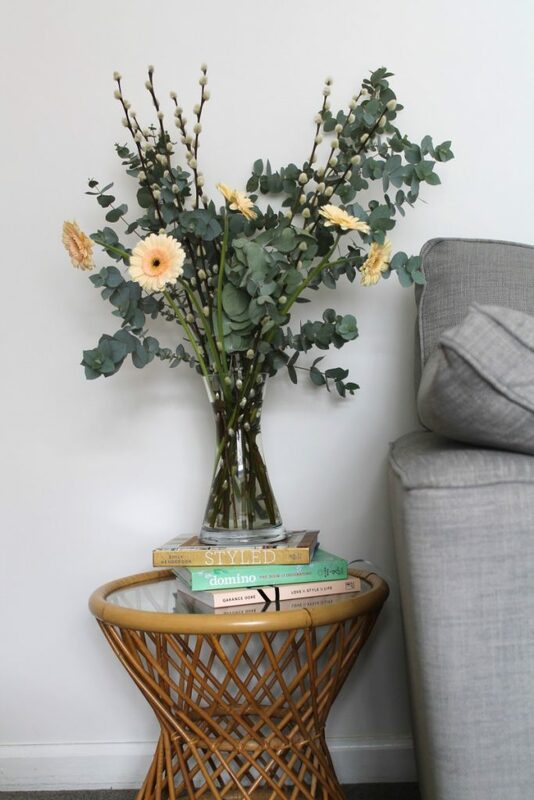 And as it happens, it was only the other day, in one of my beloved homes and interiors magazines, I read of how I could style my home for Spring using rattan! Perfect if you ask me! Yes, this plain little table has most certainly seen better days, and I must say, I’ve never really loved it, but it has certainly served us well over the years. I’ve always thought it a little unsafe to have with the children around, as you can bet your bottom dollar, it won’t be extra hard wearing safety glass or anything, but, it has stayed with us nonetheless. I have though, only very recently purchased its replacement. 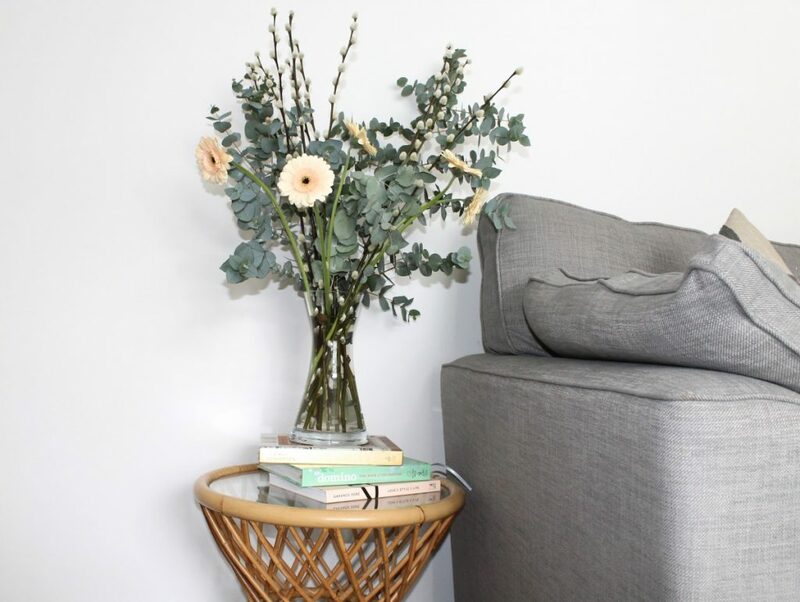 Not just because I don’t love this little piece of furniture, as I do, but because as we modernise and improve our home, it really doesn’t go anymore, and ideally I was looking for a few more side tables instead, for practicality. But I get sad as I replace these items. Little pieces of other people’s lives. Other people who are dear to me, some of whom are now unfortunately lost and gone, so as I replace each item, I do it with a heavy heart. 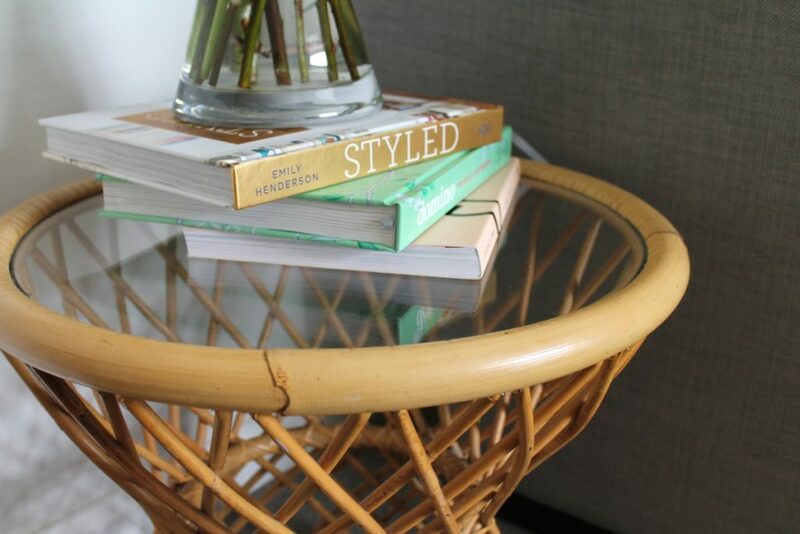 In an ideal world, I think I need to be rich, as then I could have many different houses, of many different styles, and this little wicker side table would have somewhere perfect for it to live out its days. So, I thought I would give this little table a bit of a sendoff, before it’s new and contemporary substitution comes and pushes it to one side. I’ve dressed it up for a few little photos, to send it on it’s way in style and with a bang! Am I being silly? I’ve practically humanised a table! And now I feel all guilty that I’m going to part with it, and the memories it holds. Do you have items like this in your house too? Ones you have almost a love/loathe relationship with, but ones you will find it hard to get rid of when it comes down to it? Haha! I absolutely humanise all my belongings! I have a cushion that’s in the shape of a woman’s face – she’s got a big flower headband and in my opinion is fun and hilarious. My boyfriend hates the thing, and always tries to get rid of it (or hide it) but I can’t bear to part with it! 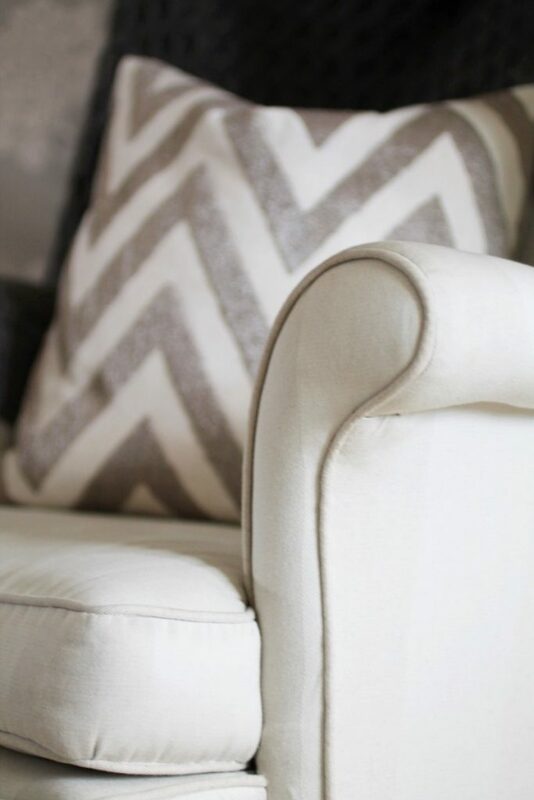 The armchair is lovely and you could easily mistake it for being Laura Ashley as it’s very much that style/fabric you’ve got which just shows that some pieces are always going to look good if you take care of them/upcycle! It’s great that you have furniture with so many memories – as we’ve been buying items for our little one due in the summer (and swapping our landlord’s furniture for purchases of our own) I’ve been thinking about whether or not they’re items we could keep long term and pass down rather than change with the fashions. 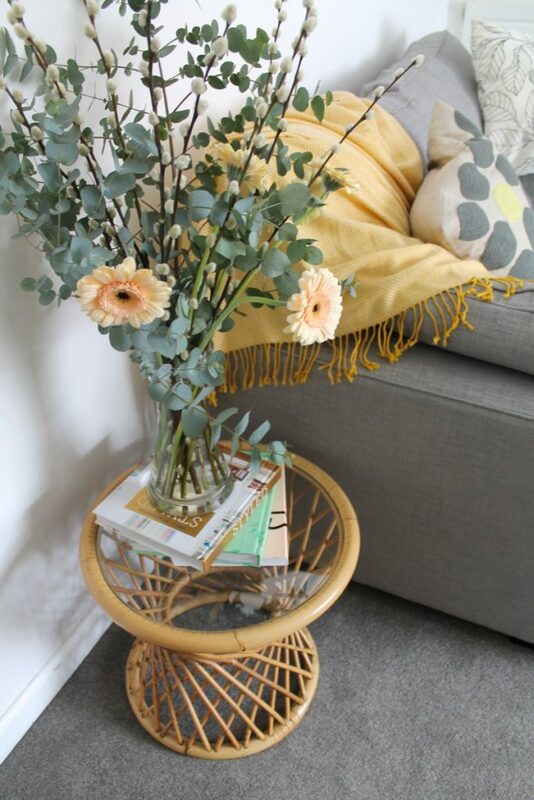 I hope the rattan table finds its way into a loving new home (though I know some furniture charity shops have changed their guidelines as to what they accept now). I know EXACTLY where you’re coming from!!!! We have quite a few items that are hand-me-downs and I’m so sentimental that I just can’t part with them. I have so many hand me down pieces of furniture at the moment that are waiting to be recovered,painted, upcycled etc! I love the stories that old chairs and tables tell and they add so much more personality to a home than flat pack furniture! 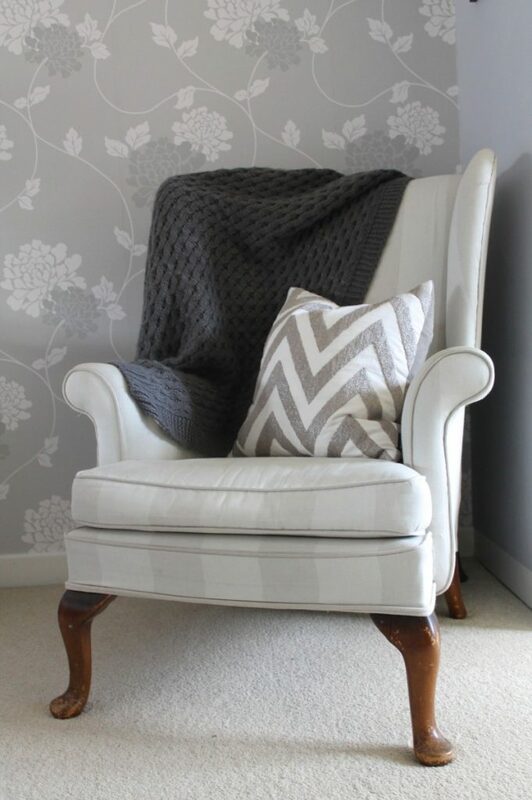 (Although it does have its place too…)I really love your grandmother’s chair, it looks so cosy!